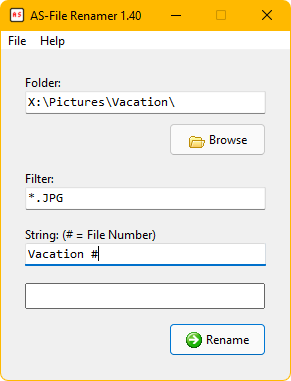 AS-File Renamer 1.40 - Rename files with serial numbers. Automatically detects how many zeros are needed to not get an unnecessarily large number of leading zeros. Do you have 10 images, they are listed as 01-10, however, if you have 9 images, they are listed as 1-9. The same principle applies regardless of number of files.